Feedback is very well listened when positive. But it is much more beneficial when it tells you what and how can you improve constructively. How is feedback structurally organized in companies? Is giving employee feedback in firms a puffy aparatus aping large corporations or an effective instrument to improve almost everything within the company? You will find out how to effectively give and receive feedback at work. You will learn how feedback is organized in leading central European marketing agencies. In our blogpost, we focus on providing feedback to employees and gathrering the feedback from them, i.e. on the communication part of the feedback mechanism. Feedback for a employee can be defined as information, criticism, or rating that one side (e.g., a team leader) provides to another (e.g., a specialist) to appreciate, modify, improve further steps or behavior. For feedback it is not necessary to be given by the superior to the subordinate (hierarchically in the company). Feedback is often given by one manager to the other (at the same level) or even a team member to his team leader (to the superior). Generally, the group feedback to an individual (for example, a whole company to the boss) or an individual to the group (for example, a team leader to his team) is common. Some companies or corporations can differentiate employee feedback, one-on-one, or performance review. They may differ in content. At the one-on-one, less structured ratings, impressions, employee’s plans are being discussed, and at the performance review structured by the process’s performance and employee results are adressed. Or they differ in composition. At one-on-one employee sits with his closest manager or boss. At the performance review the specialist or HR specialists could join them. Smaller companies, like Basta Digital, in the effort to avoid complexity and repeated encounters often mix multiple evaluation formats into one. Therefore, we communicate the feedback to the employee at the same time as we evaluate his / her work results and performance. One-on-one often goes very informally, sometimes out of the office. What is the feedback good for? It is almost impossible not to provide feedback at work. You do that when you appreciate, criticize, suggest improvements to anything or anyone at work. Using the parallel of personal life: If your partner always oversalts your favorite soup, it’s better to let him know. Otherwise, you will enjoy it rarely, perhaps at your mum’s visit. In the blogpost we do not focus on the ad hoc feedback that your colleague sitting at the next table can provide you anytime. We focus on an organized way to provide feedback. The feedback mechanism in companies is one of the best inventions that helps to improve work practices, work habits, job results, eliminating work bad habits, improving interpersonal working relationships, enhancing individuals’ abilities, improving the workplace and contributing to a better work environment. Data that is part of the feedback (e.g. invoice hours for a employee, NPS of employee’s clients, etc.) should be available to the employee as well as to the manager anytime. This will allow both sides to keep track of the development and to the employee to improve. It is essential not only to provide feedback to employees but also to get back it from them. Constructive feedback will allow to the employee to improve specific skills and focus on the most important. Feedback from the employee to the manager will enable to improve work conditions, remove obstacles, or prevent unwanted employee leave or loss of motivation. It is said that the feedback is the treasure. For your most nifty and most proactive people, the feedback is lifewater. They are able to do a lot of good work and appreciate that you will provide them a continuous rating, which will contribute to even better results of their effort. In this blogpost, although we focus on the feedback system within the company, we can also get feedback from the client or provider (and we proactively ask for it) or give it to the client. In an effort to enhance the effectiveness of the feedback mechanism, companies implement various automated tools that simplify not only data collection but also feedback gathering with the objective to save time = money. At Basta digital (former Pizza SEO), we have been organizing meetings to provide feedback to employees since the company’s foundation in 2006. We have experienced hundreds of them. They were also some where both sides (both the manager and the team member) were leaving with a clear idea of what to do next for success of (team member, client project, company), but also those that resulted in unspecified expectations from a team member which have never been filled and quickly ceased to be important. Over the years, we have been using a number of effective practices to streamline the providing and gathering of feedback. Ad hoc feedback to a colleague, when something goes right or wrong , is important and effective. You do not have to wait 2 months until the end of the quarter for the deadline for a regular feedback meeting. In addition, a regular feedback meeting should be implemented in the company, which everyone counts with. It is usually organized by the manager for each member of the team he manages. At Basta digital, every three months. prepares general feedback of the office, colleagues, processes, and so on. Feedback meeting is moderated by the manager or direct supervisor, as he/she gradually passes all the points with the employee that both have prepared. How to give good goals to employees? It will be much easier to evaluate your goal of „Publish 3 blog posts of PPC in Q3” or „Get 2 outputs at the conference about the attribution models in Q4” than „Improve time management”. When designing goals, it is important to make sure that they will be also relevant to the next feedback. We have experienced many times that none of the attenders gave an importance to the proposed goals on the next feedback. Are you happy that you work here? What we do not do and we should do? What is the biggest opportunity we are missing? What do you dislike about our services and products? What would you change if you were me? Who is the best in this company? Who do you admire? What do you dislike about working in this company? What is the biggest problem of this company and why? If we were to improve our company, how do we do it? The manager should make sure that the colleague understands and is identified with the results of the feedback. The points that have been agreed upon at the meeting need to be written down. Either you have a HR tool with such functionality, or you have a project management tool or a plain text document for each colleague. If you do not organize your feedback very often (for example, once a month or more often), it is a good idea to keep track of progress on the goals and activities agreed with your colleague at the meeting. It is important not to forget the promises your colleague has received (wages, promotion, training, hardware, etc.). Do you have a colleague in the team to whom no one wants to give feedback? There might be several reasons, but neither will be positive. For example, bad experience from past feedback, poor progress, his/her inadequate communication, mutual antipathy, and so on. It is the right time to start thinking about changing his manager or farewell with a colleague. We provide feedback not to show colleagues that they have failed at work. We give feedback to colleagues, because we want them to succeed, as we have already accepted them, and we want to help them. We do not smell about when they make a mistake, but we try to prevent them by mentoring and training. The 19th Top European Central Marketing Agencies have been asked 10 questions about how the feedback mechanism works within their companies. We wanted to find out the best practices and inspire all of us. 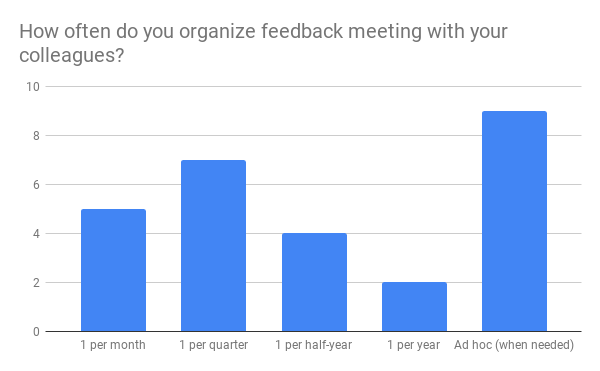 Graph: How often do you organize feedback meeting with your colleagues? Most of the addressed agencies organize the feedback meeting quarterly, but do not hesitate to organize an extraordinary meeting when necessary. Graph: Who participate in the feedback meeting except of the colleague which is the subject of the feedback? 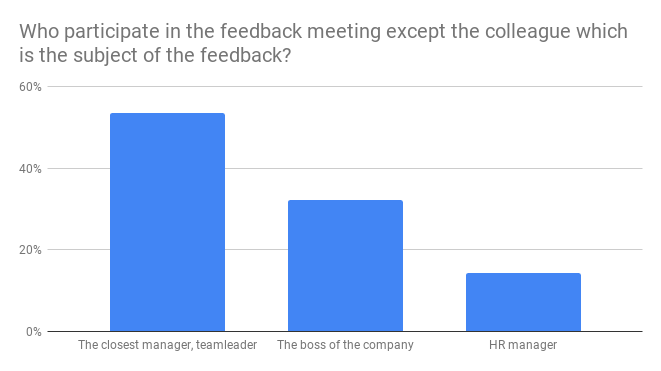 The feedback meeting is except of an employee attended by the closest manager or team leader (54% of responses). Relatively often, the boss is also present (32% of responses). A HR manager or a specialist is not common for companies of the size we have addressed, so only in 4 out of 19 addressed companies are present at the meetings. Graph: Who can give a feedback to a colleague at the feedback meeting? 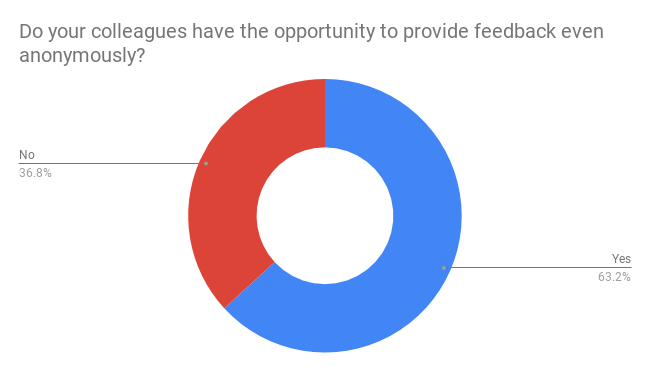 Before organizing the feedback meeting, the manager in the addressed companies most often asks feedback to a colleague from his direct superior (manager, team leader), respectively himself (39% of cases) and from employees at the same level as the colleague who is the subject of feedback (25% of the answers). Graph: What do you usually discuss in the feedback? 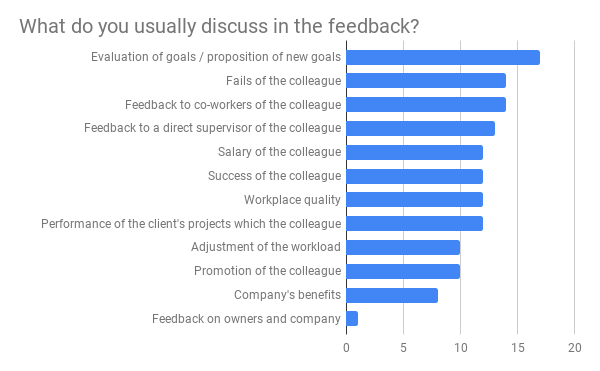 On the Feedback meeting in the addresed companies is the most often discussed the evaluation of the goals of a colleague that is the subject of a meeting, or proposition of the new goals. They are often also the subject of a debriefing of a colleague’s failure or misconduct, that is, things that have failed. Less often, they get to discuss specific results on client projects or company benefits. 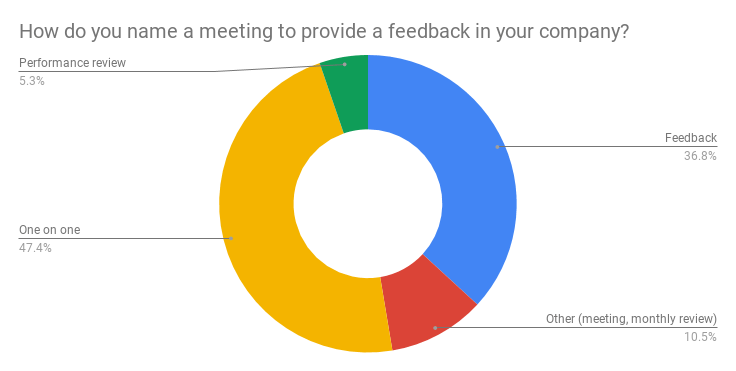 Graph: How do you name a meeting to provide a feedback in your company? Slovak and Czech companies use more the name feedback, foreign ones rather use one on one (or one to one). Graph: Do your colleagues have the opportunity to provide feedback even anonymously? The anonymous ability to give feedback to a firm is common in 63% of the companies addressed. Anonymous feedback occurs most frequently through the questionnaire (eg through Google Forms). 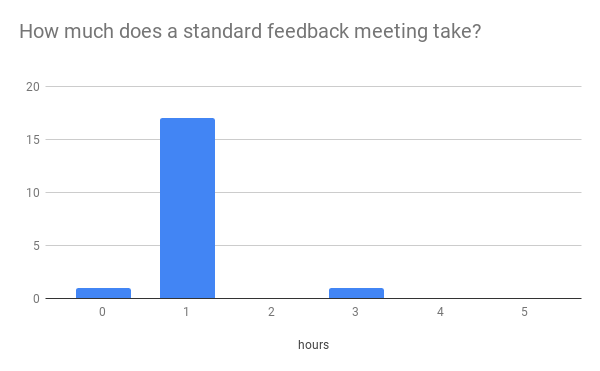 Graph: How much does a standard feedback meeting take? The feedback meeting in the agencies takes circa almost one hour. Feedback is the treasure. You will most appreciate its importance when you will not receive feedback at all. If your feedback is not driven by a set of processes, it’s hard to improve its quality to increase the benefits for individuals and for the firm. If the feedback is negative, the first hearing might not be positive. But if it is also constructive, it is very useful for an employee or organization. The boss or manager may not notice the destructive elements in the teams. While an employee can be smart and keen, he can concentrate on misbehavior. In order for the manager to provide quality feedback, he must work on his / her management skills, which must certainly include the ability to listen and understand the other person. We will be glad that you give us feedback on this blogpost. Write us a message or on our Facebook page. Note: Lenka Hricová, HR Generalist at ESET, has provided valuable input to this article. Lenka, thank you very much!